I picked up the new D&D Monster Manual shortly after it was released. The quality of the book is striking, from the physical appearance to the content inside. There is quite a lot to like about this, the second major rulebook for 5th Edition. Reviews all over the blogosphere have been overwhelmingly positive, and deservedly so. The amazing cover, meticulous graphic design, and sturdy heft of the book make it look and feel wonderful in your hands. The interior art ranges from simply good to bedazzlingly perfect, and the book strikes a balance between pleasantly fluffy and satisfyingly crunchy. It is a fine follow-up to the Player’s Handbook, and bodes well for quality of the upcoming Dungeon Master’s Guide. But is it the best Monster Manual ever? If you had asked me this question the first night I read it, I wouldn’t have hesitated at all before answering a resounding “YES!” However, after the new has worn off slightly, I am not as certain. It might not be a fair question. Does the 5th ed Monster Manual need to be the greatest one of all time? Not really. I think it is a contender, but a few offerings from the past might actually be better, or, at least, just as good. For the purposes of this comparison, I am only referring to official material from TSR or WotC, released for any version of “core” Dungeons & Dragons. No other game systems, or setting specific stuff. (Sorry, Ravenloft Monstrous Compendium.) I should also disclose that I have no experience at all with D&D 3.0 or 3.5. Fans of those tomes, please don’t get upset when I don’t mention them. Let’s get the obvious out of the way. The first edition Monster Manual for AD&D is the gold standard. All subsequent collections owe too much to the original for it to not be considered as the best. 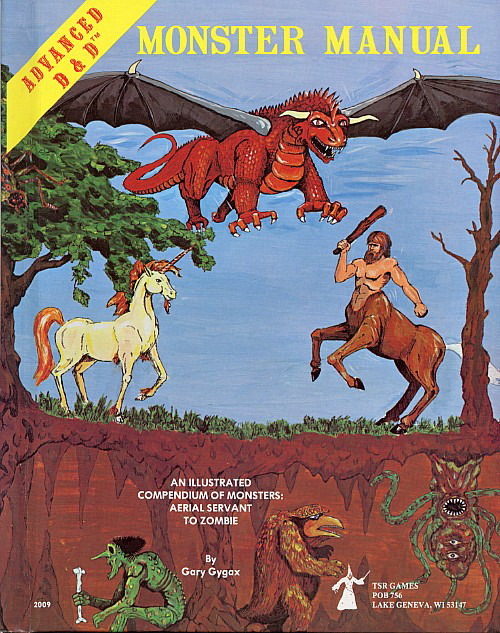 The 1E Monster Manual is iconic and deserves a place in the discussion. However, as the first in a line of continuous revisions, it falls short when compared objectively to its descendants. The art, layout, and overall weirdness of old school AD&D make it less useful at the table. That doesn’t make it less important, but the book isn’t even close to perfect. For similar reasons, the Fiend Folio is out of the discussion, even though I love it so much. Most of my D&D playing years took place in 2nd edition. The first “Monster Manual” for 2E AD&D was the Monstrous Compendium. The brilliance of this release was that it was a three-ring binder full of one-sheet descriptions of monsters. 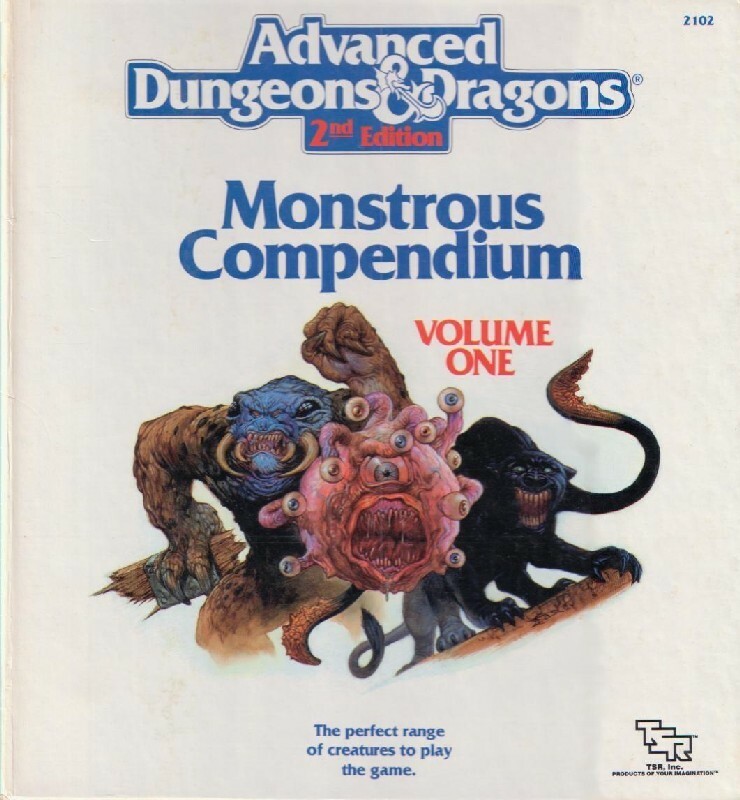 For a guy like me who was (is) a little OCD about organizing game components, the Monstrous Compendium was the greatest thing ever. Bigger art, more descriptive text, and slick Jeff Easley cover art made this a huge improvement over previous offerings. The expandable, customizable nature of the MC was its greatest strength; you could keep all your monsters in one place, or just use the ones you needed for a particular adventure. Only two things mar the otherwise flawless nature of the Monstrous Compendium: the page holes tore easily, and monsters would often be printed back to back, ruining the otherwise glorious alphabetical order once multiple supplements had been obtained. Skipping forward almost two decades, we move to the 4th Edition era. The finest offering from this edition was the last: Monster Vault: Threats to the Nentir Vale. While I dearly love the original Monster Vault, its successor is a superior product. The larger format of the book was welcome, and the included map and token sheets were even better than those that came with the first Monster Vault. But the best part was the wonderful design of the monsters inside. 4E had really hit its stride when this was released, and the creatures in this book married theme to mechanics in a way few other Monster Manuals have managed to replicate. Additionally, the book was dripping with lore and adventure ideas. I especially loved the one of a kind monsters contained within. Threats to the Nentir Vale is the high water mark for 4th Edition, and a serious contender for “best ever”. So how does the 5th edition Monster Manual stack to these three? Let’s compare them in reverse order. Threats to the Nentir Vale and the 5E MM are clearly very, very different products. The former was released near the end of 4th Edition’s lifespan, and it is clear that the designers really had a good understanding of what 4E offered. Remember all of the issues with the monsters in early 4th edition? They were quite a mess. Both Monster Vaults fixed many of these issues, and the monsters were amazing as a result. 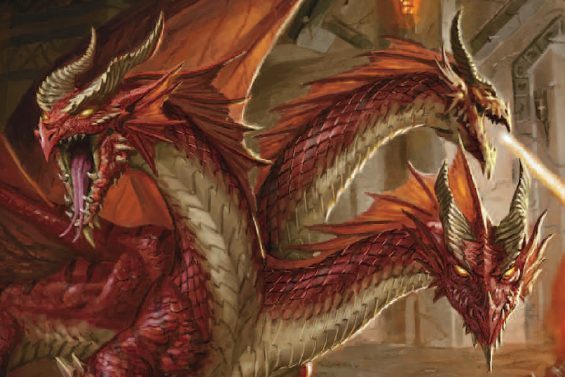 In contrast, the newest Monster Manual is one of the first 5E products to hit the shelves. It is certainly a useful tome, but it doesn’t quite have the level of razzle dazzle I was expecting. The Player’s Handbook was a showstopper, but the MM seems a bit lacking. The designs of the monsters are a bit too generic, some seeming to be just collections of statistics without distinguishing characteristics. Orcs and goblins feel nearly the same mechanically, and that’s a pity. I’d also like to see more variety among the iconic monster varieties; we have dozens of dragons represented, but only two bugbears, for example. The monsters inside the 5E Manual are perfectly usable, but not particularly imaginative. Let’s move back next to the 2nd Edition Monstrous Compendium. Obviously the 5E MM blows its ancestor out of the water from an artistic standpoint. The illustrations are painted, and in full color to boot, eclipsing the black and white line art of the MC. Moving beyond that, there is a roughly equal amount of lore and background in the two. The layouts are quite similar, in fact. The biggest advantage the 2E binder has over the 5E tome is tabletop usability. Using the binder system, I could put the monsters in any order I liked. As a bound book, the 5E Monster Manual cannot be altered in this way. That wouldn’t be an issue if the entries were arranged alphabetically. But they aren’t. There is a monsters section, a “Miscellaneous Creatures” section, and an NPC section. I don’t care for the pulling out of NPCs, but can understand the difference between them and monsters, at least. But I cannot understand why “Miscellaneous Creatures” are listed separately. Is a Giant Spider a monster or a creature? Who knows? It has caused delays in my games already, and probably will continue to do so. Finally, let’s compare the original AD&D Monster Manual to its 5th Edition descendant. These two seem to have the closest relationship. The new book truly feels like a remake of the old one; not a terrible “re-imagining”, but a thoughtful remake using modern technology and the benefit of nearly four decades of RPG development. 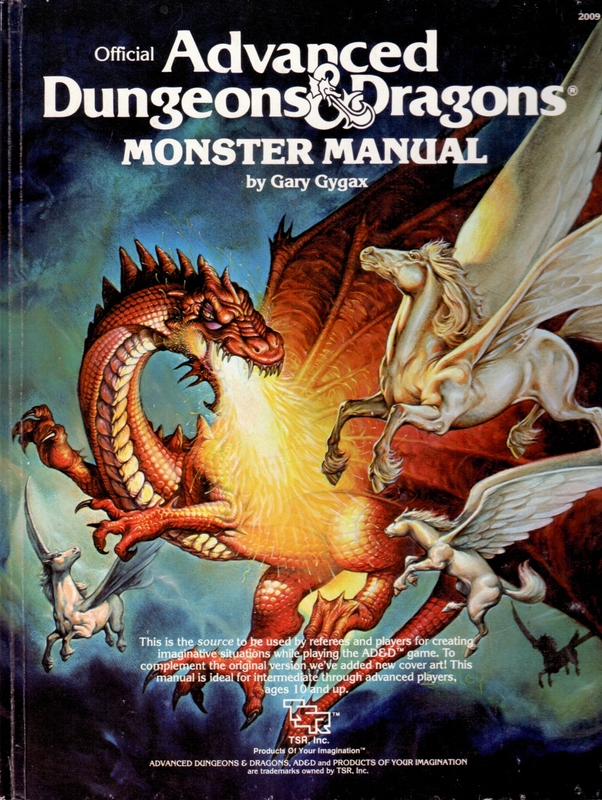 If the 5E MM were the first such book you had ever seen, you would walk away from it with the same feeling of wide-eyed awe that some of us did when we gleefully devoured the 1E version years ago. I consider this to be the most important aspect of the Monster Manual: to inspire Dungeon Masters to populate great adventures with fantastical foes. By this measure, the 5th Edition Monster Manual is a success. So is the 5th Edition Monster Manual the best one ever released? It’s an impossible question to answer. Just as I couldn’t choose which of my sons I love the best, I cannot decide which Monster Manual is the greatest. Threats to the Nentir Vale has amazing mechanics, the Monstrous Compendium is a neatnik’s dream, and the first Monster Manual is a nostalgic favorite. The 5E MM has advantages and disadvantages over all three of these, and deserves to be mentioned in any discussion of which is the best. Despite a few nagging bits here and there, the new Monster Manual is a magnificent book, and will surely provide many hours of enjoyment at D&D tables for years to come.